Mexican dishes in a cool setting. 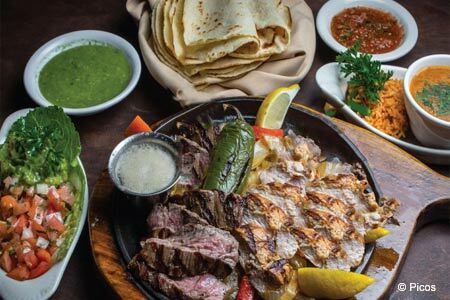 : After 30 years at its Bellaire location, chef Arnaldo Richards and his wife Janice moved this restaurant inside the loop to a remodeled building that's reminiscent of a Spanish-style hacienda, complete with a gurgling fountain, comfortable leather chairs and wrought iron coat stands. There is a tequila room lined with bottle lockers for rent, and most nights you’ll be serenaded by strolling mariachis as you sip premium margaritas. While the menu is heavy on Mexican dishes, there are the usual Tex-Mex offerings, too: a spicy chile con queso and nachos, which make good starters. And there are also typical enchilada platters, but we prefer the split chicken smothered in a rich mole sauce served with refried beans and rice. Still, what really sets the place apart from other Tex-Mex, Mex-Mex spots is the seafood: calamari sautéed with fresh tomatoes, onions, serrano peppers and cilantro; red snapper charbroiled on banana leaves; and sautéed Gulf shrimp and lump crab meat enchiladas topped with poblano cream sauce. Professional service and a dessert tray paraded by your table complete the experience. Weekends start early with an à la carte breakfast menu before the all-you-can-eat buffet brunch sets up with tables laden with ceviches, moles, tamales and more.